Don't hang your plants where the sun don't shine! I've recently confirmed that my green thumb wavers between shrivelled and brown. Naturally, last November I was given an orchid — one of the hardest plants to take care of. Two months ago, my boyfriend came home with a lovely present for me, you guessed it, another orchid! My journey taking care of these orchids has been one of confusion, obsession and Googling. Now that the weather is colder and my basement apartment gets sun through only one window, I've had to find a way to keep them alive. I figure I'm not the only one out there trying to get my indoor plants closer to the light, so so I thought I'd show you what I came up with. Also, this plant holder makes for a fun gift for your mom, grandma, friend —really, any plantlover in your life. Remember there's only 43 days until Christmas! I adapted this DIY from a post I found on Pinterest called DIY hanging planters. I made two of the planters, as I have two orchids to hang, so I tried a variation with the second one. 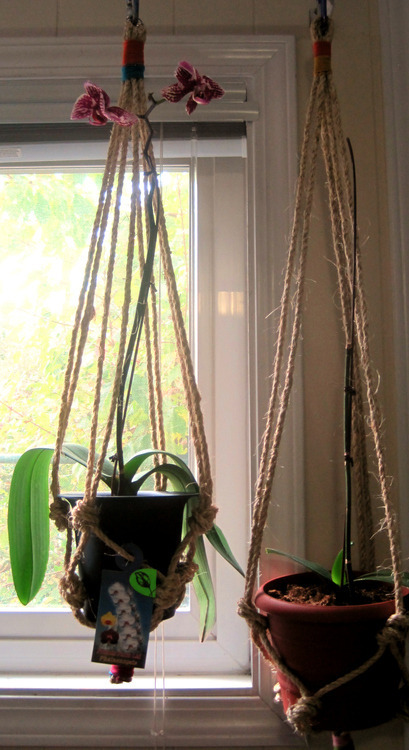 The pot is bigger so I made my plant hanger with only six cords with the hope of accommodating the wider pot. I think it worked! Measure out four 8 foot or 96 inch lengths of your rope. Loop them through your closed hook or carabiner stopping at the middle. You will now have 8 equal length cords hanging from your hook. Hold the rope together at the base of your hook and wrap electrical tape around it two or three times (or about 2 inches). After your tape is secure, wrap your embroidery thread or leather around the tape, making sure you hide the tape completely. You could get different coloured electrical tape and just use tape if you like the look of it. Measure 24 inches from the base of your wrap. 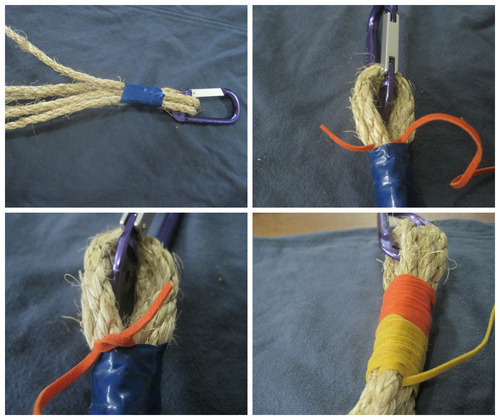 Take two lengths of rope that are side by side and tie them together using an Overhand Knot. Repeat with the remaining lengths until you have four knots. Measure another 3 inches and repeat the same process. Gather the rope another 3 inches from the final knot and tape together with electrical tape. 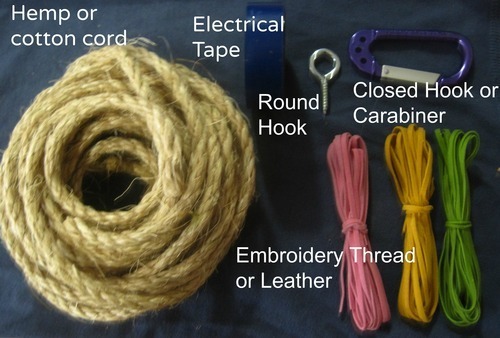 Wrap your embroidery thread or leather around the tape the same as Step 2. Hang your plant holder from the ceiling using the round hook and place your pot in the holder and you're done. Ciao!